Yann Fulliquet is one of those guys that's been around Planet as long as Planet has been around. This (his fourth) CotM augments several other articles and many images featured on the site from our most prolific Swiss contributor. His taste and knowledge of catfishes, and indeed fishes, is broad and this is well demonstrated in his chosen, brilliantly obscure, selection for this months featured catfish. Hands up who thought is was a loach! 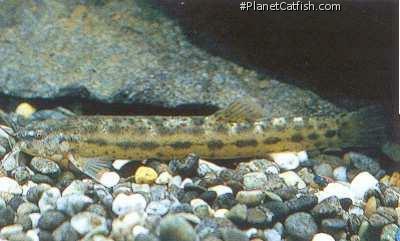 Catfish from the Trichomycteridae family have a rather bad reputation as being parasites. This is indeed true of some members from the family, others, like the species of the genus Trichomycterus suffer unjustly from this reputation. This is a real shame, because they offer interesting behaviour. This is a fish that is not commonly exported; perhaps even it is fair to say it is rare to find such fish. I was lucky to find them once. The fish were identified as Trichomycterus alternatus which seems plausible but since this genus is poorly known and some species can be very similar, one never knows. This fish doesn't grow bigger than 10cm, and mine were not even that size. It is a rather small to medium size species for the genus. The six fishes I received were first placed in a 30 litre tank to be quarantined, but I soon discovered that these fish were very good at finding even the smallest hole in the set-up to escape the tanks. I found the following morning two specimens dried on the floor. So I removed them and placed the remainder in a 60cm long tank, with gravel, roots and plants along with some Apistogramma and a pair of Ancistrus. The temperature was around 24-26°C, and the tank was filled with tap water (pH: 7.4, conductivity 300 microsiemens). During the day they would hide in the substrate and in the different elements of the aquariums furniture. They are mostly active at night, where they will swim very rapidly undulating their body like a snake at a very fast pace. Handling them is extremely tricky as they rarely stay motionless when caught in the handnet or in the hand. They are experts at escaping wherever they are. So make sure no space is open in the tank otherwise you will find them out of the tank in less time than I used to write that down. They really like to bury themselves in the sand á la Bunocephalus, leaving the mouth, barbels and eyes out of the sand/gravel. They can bury themselves quite deeply into sand, their bodies look bent when seen sideways. Sand will be best for them but they managed such a feat with gravel as well. Feeding consisted of frozen bloodworms, Artemia, pellets and tablets. Once food is given, they will actively swim in search for food and pounce on the food. They are not picky eaters and you should be careful not to overfeed them. Tankmates should be fast enough to compete with them as they are very active once food is given, especially if it is after dark. Sexing these fish is easy when you have mature individuals that are well fed; females develop a nice and rounded belly where you can see the egg mass. Males stay slender. Unfortunately these fish have yet to be spawn under captive conditions. Although their spawning behaviour has been studied in the wild it is yet to be determined exactly. Sadly, I lost mine due to a power break down, I was away for the whole day and once I got back found all of my Trichomycterus dead while the other fish were doing fine. I conclude these need a good current to keep the water well oxygenated and won't do good in still water or low current ones. Hopefully I will be able to find some more in the future as they are very interesting fish worth a place in anyone's tank. Type Locality Rio Doce, Brazil. Etymology Trichomycterus: From the Greek trichos, meaning hair and mykter, meaning nose; in reference to the barbels. Sexing In well fed individuals, one can see the egg mass through the belly of the female. Distribution South America: coastal river basins in Rio de Janeiro and Espírito Santo, Brazil. Other Parameters Prefer cooler water, dissolved oxygen saturation is better to the higher level. A good current is also preferred. Feeding Live or frozen food is well accepted, as is commerical dry prepared foods. Be careful not to overfeed. Furniture Will do best in a sandy bottom with some cobble / pebble substrates. Plants are not necessary but can provide some hiding places as would driftwood. Compatibility Keep with similarly sized fish (so the catfish won't be eaten) but is active enough to compete with them for food.